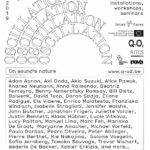 Oscillation is a project and festival circling around various aspects of the nature of sound, with a special curiosity about its capacity for creating and sharing space, its propensity to occupy the zones in between spaces, positions, events, discourses, etc: a betweening space. Sound travels, hops borders, passes through walls. It is endlessly participative in that we share it all the time, often unwittingly. It entangles itself in the necessarily messy gaps between us. Sound offers a framework for thinking the in-between as a space that not only needs boundaries in order to exist (what is a space without limits to define it? ), but whose very presence both creates and parodies the fixities of those boundaries. A discourse of inbetween-ness cannot be fixed but is always made up of a great many tentative constructions and holdings in place. Oscillation is organised by Q-O2 workspace, co-produced by RITCS-School of Arts. It takes place in the framework of the Interfaces project, and is co-funded by the Creative Europe Programme of the European Union. It is realised in cooperation with Argos, Art Brussels, Au Quai, Cinema Nova, Decoratelier Jozef Wouters, Eglise St. Jean-Baptiste Molenbeek, La Fonderie, Le Lac, Recyclart, Werkplaats Walter. Q-O2 is supported by the Ministry of Culture of the Flemish Community, and the Flemish Community Commission of the Brussels Region.